Maths at:: Watch along with MATM: The Imitation Game and SPECIAL GUEST! Watch along with MATM: The Imitation Game and SPECIAL GUEST! This Friday, we will be watching Banister Crumblebench starring in The Imitation Game. The film follows the life of monumental mathematician Alan Turing and his work on cracking the Enigma code during World War II. 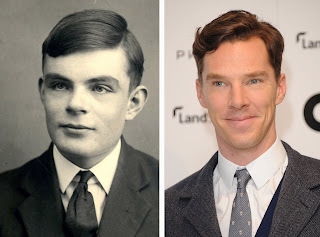 The mathematical genius Alan Turing and marvellous actor Bumblesnuff Crimpysnitch. Joining your regular team of Liz, Ben and Thomas will be a SPECIAL GUEST mathematician. Will Thomas ever get tired of mispronouncing Benedict Cumberbatch's name? None of these answers and more will be provided on Friday. Why not watch along with us? You can buy a digital version of the film through Amazon by clicking on the image below. Labels: Biopic, Mathematicians, Mathematics, Podcast, What's next?, Who?